You hear the words “Hitler,” “Nazi,” and “Fascist” thrown around a lot these days. But to see if they are valid descriptors, or just extreme labels meant to inspire a negative emotional response without any correlation to actual facts (a la John Kerry’s claim that American soldiers in Vietnam “razed villages in a fashion reminiscent of Genghis Kahn,“) we have to know what those facts were. This history series on fascism and nazism will feature quotes taken from reputable sources, by the historians who lived through the events of the 1930s and 40s. You hear the words “Hitler”, “Nazi”, and “Fascist” thrown around a lot these days. But to see if they are valid descriptors, or just extreme labels meant to inspire a negative emotional response without any correlation to actual facts (a la John Kerry’s claim that American soldiers in Vietnam “razed villages in a fashion reminiscent of Genghis Kahn,“) we have to know what those facts were. This history series on fascism and nazism will feature quotes taken from reputable sources, by the historians who lived through the events of the 1930s and 40s. 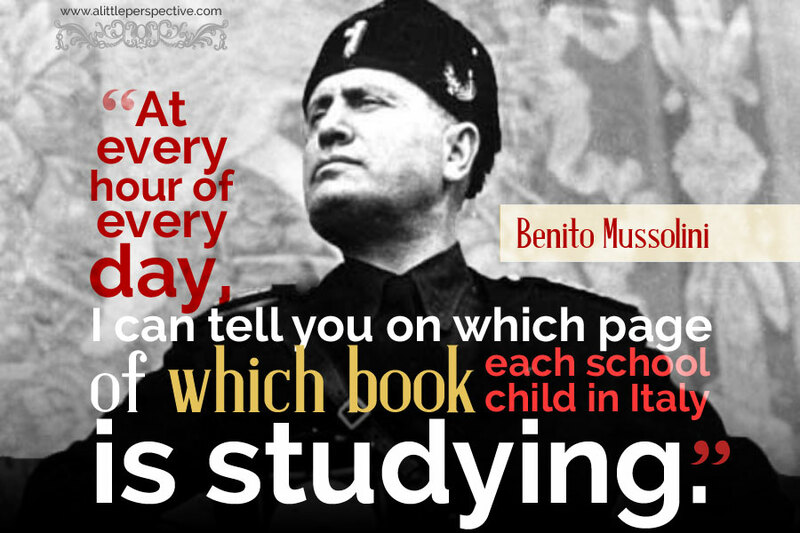 And we have to start with Benito Mussolini. When Mussolini took power he had no program except to retain his job. He admits this candidly. But he quickly found a program, which derived from a desire to replace the class struggle, which–certainly–he had done more than most men to intensify, by some sort of class collaboration. This was the origin of Fascism in practice. The contrast to Hitler is striking. Hitler came to power with a very definite program, and soon lost it; Mussolini, devoid of program, quickly invented one. The outlines of Fascist economy are known to everyone. Private property, private profits, are preserved, but under strict state control. The entire productivity capacity of the country, theoretically represented by employers and employees both, is organized into a series of twenty-two “corporations,” from which deputies from the lower chamber of parliament will be chosen. Representation will be on the basis of occupation instead of geography; a deputy will represent, say, the hotel business instead of the province of Turin. The scheme was put forward cautiously, and expanded very slowly; in 1936 it was still an embryo structure. Every corporation contains three supervising delegates to the Fascist party; each corporation is headed by a member of the cabinet or an under-secretary, appointed by Mussolini. The deputies, moreover, are “voted” into the chamber from an approved list chosen by the Grand Fascist Council; electors are privileged simply to say Yes or No to the whole list. Mussolini’s two general “elections” have been grossly dull affairs. The state, being supreme, regulates the economy for its exclusive benefit. Fascism may be, spiritually, “an attempt to make Romans out of Italians,” but physically it made Italy a prison. “Fascism is a series of ideas turned into a person,” according to Gentile; and the peculiar person and character of a Mussolini determined the repressive shape it took. The son of Alessandro Mussolini (who named him after Benito Juarez, the Mexican revolutionist who ordered the execution of the Emperor Maximilian) and of Rosa Maltoni, who was the school-teacher of the village, grew up in the most crushing poverty … then he taught school himself, until he fled to Switzerland at the age of nineteen to avoid military service. He earned a living as a mason and a laborer; at night he studied socialism. 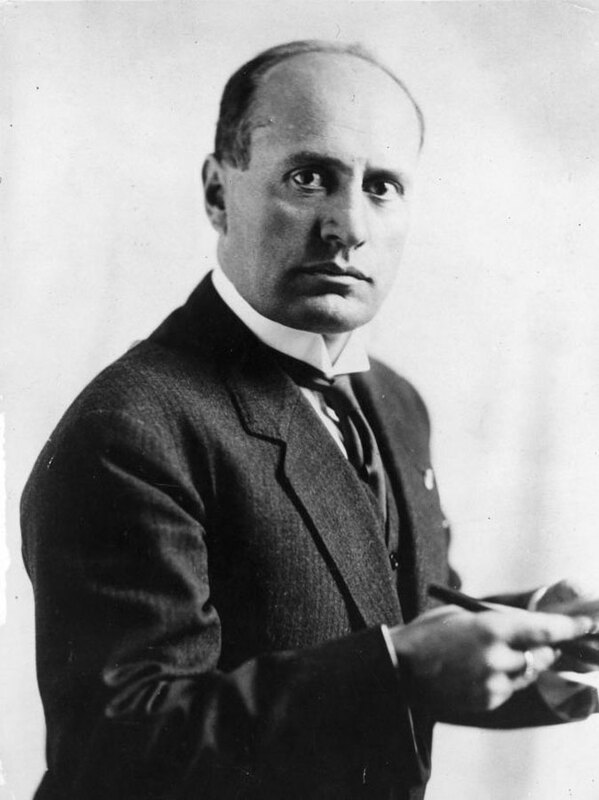 … Mussolini returned to Italy in 1904 at the age of twenty-one and spent ten years as a red-hot socialist. John Gunther, Inside Europe, pp. 188-89. In 1922 all of Italy was in upheaval. In that year, Mussolini’s Fascist party made their famous march on Rome. He put down the rival Communists and took over the government. He also took a title: Il Doce, or the Leader. Indeed one may assemble a seemingly impressive list of anti-capitalist forces in the corporate state. No employer may discharge labor without government consent. No capitalist may undertake such comparatively minor independent activity, as, say, enlarging his factory, without state approval. Wages are determined by the government; the employer may hire labor only at government labor exchanges. A factory owner may not liquidate his business without state permission; the government controls his sources of credit; and it takes a large share of his income in Draconian taxation. John Gunther, Inside Europe, p. 205. The chief goal of the Fascist state is to wage war, establishing Fascism over as many neighboring nations as possible, so that the Fascist state grows into a Fascist empire. Already we can see that partisan claims of “Fascist” for President Trump and his supporters is completely out of line with reality. The President’s policies are designed to decentralize federal power and return power to states and individuals, the very opposite of Fascism. The President’s policies are designed to unchain the economy and restore greater abilities to business, labor, and the free market, the very opposite of Fascism. The President’s policy to build a strong military is not so that it will be used to pursue war, but so that it will deter others from waging war against America and Americans; “peace through strength,” the same policy employed by Teddy Roosevelt and Ronald Reagan. Now that we have Mussolini’s, the creator of Fascist policy, political philosophy down, the next time we can look at what actually happened in Italy from the time he took power and instituted the Fascist state, until the time his reign was ended.